The fake bees are here, too. Currently I’m seeing fairly big ones, about the size of a honeybee, but their buzz sounds more like a whine. They look just enough like bees to fool you as they stroll around the flowers, but when they land — no way! That’s a fly. I think these are Narcissus bulb fly. Most of the syrphid flies I see are pollinators and predators, but these guys are total freeloaders. They hatch from the daffodil bulbs and do their little bit of fly business before laying eggs again. No wonder I see a few more every year. 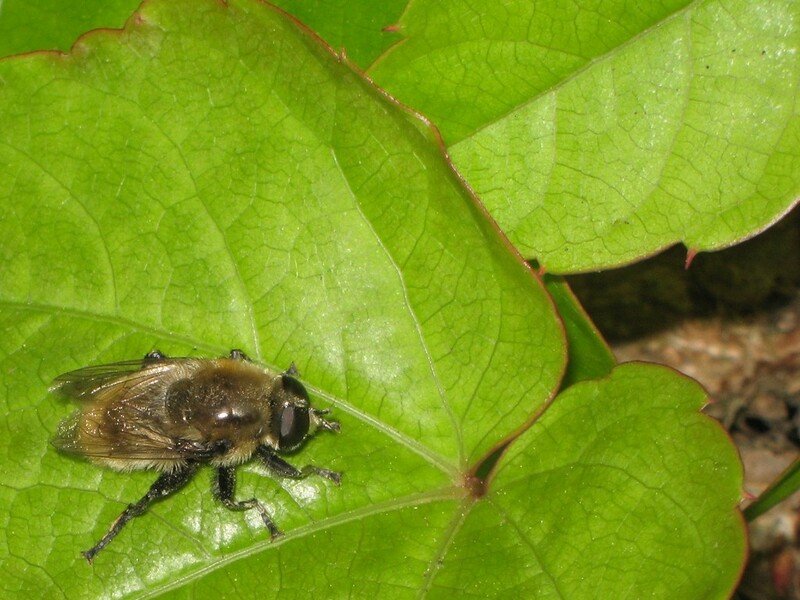 This entry was posted in Bees, garden and tagged bee fly, Narcissus bulb fly, syrphid fly. Bookmark the permalink. You seem to know your flies. Can you look at the flies in this blog and ID them? I’ll link your name/blog to them. I just love the biomimicry of flies pretending they are bees. I feel fairly confident about a few bee flies and flower flies, but there’s a LOT of flies to know!